And, like so many things, food is best kept simple. We have built the reputation of the Griffin's kitchen on this maxim. Menus change daily and seasonally. 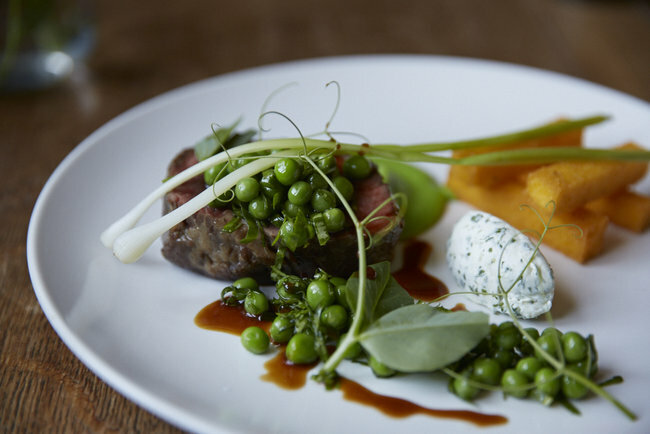 In winter you might have venison from the nearby Welsh Venison Centre, or in summer Welsh lamb with peas picked that morning from our own kitchen garden. Where to eat? The smaller tables in the Library or Tack Room, warmed by the log fires. Or at a larger table in the Aga Room, for groups of up to 18. If a dog is with you, we're happy for you to eat in the Bar or Tack Room. And lunching in the garden under an umbrella is a realistic aim for the golden days of a Welsh summer. It does happen, we promise. We never want to turn you away but we may not be able to find you a table if you turn up without booking. 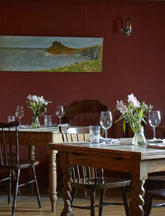 So, we recommend booking, even if you call on 01874 620 111 only a few minutes before you arrive. Lunch can be as fleeting or as laboured a visit as you like. Our menus suit all from the walker seeking refuelling to the serious luncher looking to settle in with a carafe of wine or two. Have a look at our lunch and Sunday lunch menus to see examples of what you might eat were you to eat with us. And we're now open for Not Lunch, Not Supper right through the afternoon if our times don't work for you. Sharing boards laden with the best of our local producers. For more details on allergies and food intolerances, service charges and group bookings, and a look at our own organic kitchen garden, do look at our second Eat page. Our supper menu is short, seasonal and delicious. All our food is cooked to order and the menu will change a little every day depending on what our suppliers are bringing to us. Click to our supper page to see what you might eat for your supper were you to visit the Felin Fach Griffin at this time of year. We have long been wary of some guidebooks and inspectors. Eating is about joy and that is sometimes forgotten by those for whom eating has become a profession. But, for what it's worth, we've been included in The Good Food and Good Hotel Guides and Hardens since opening, as well as many travel and food websites. We are the proud holder of Wales' only Bib Gourmand from the Michelin Guide.